Mark Smullen, a member of the Machteld Faas Xander family, spent his Victoria Day long weekend differently than the majority of us. Mark and his wife, live on an alpaca farm. 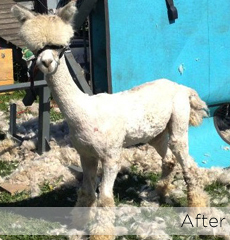 Last weekend, Mark, his wife and their friends, other alpaca farmers, embarked on shearing the alpacas. There are 32 of the furry friends in total. Mark and his wife own 20 of the alpacas and the other 12 are being boarded on the farm for other farmers. 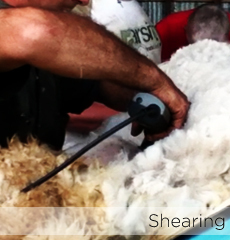 To shear the animals, two shearing tables are set up. There is a designated shearer who is accompanied by two or three others who manage the alpaca. The alpacas are secured with straps to ensure the safely of the animals and the humans. Some of them cause a fuss, spitting and thrashing or squealing, it can be frightening for them. To calm them, the people speak softly to them and sometimes uses a refreshing lavender spray. 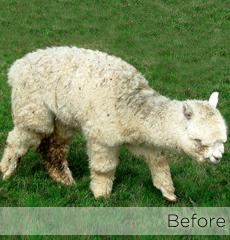 Unlike sheep fleece, alpaca fleece contains no oils and is hypoallergenic. It is also much finer. After being sheared, the fleece is sorted according to quality, and then it is sent to a fiber mill where it is processed into yarn, or products such as socks, mittens, or gloves. Everyone comes together for lunch and supper. 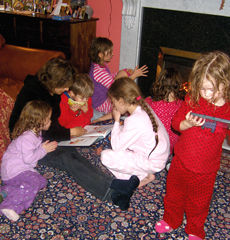 Even though the work is hard, his friends and family make the time enjoyable and fun. Mark shares that although the sore backs and alpaca spit are unpleasant, the good company, the laughs, and the feeling of a job well done make it all worthwhile. 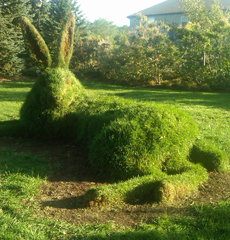 posted by Jessica on May 31st, 2012 | Arts Awards Waterloo Region is Almost Here! Across the Region, arts enthusiasts are anticipating this year’s Arts Awards Waterloo Region. The event is being held this Sunday, June 3, 2012, at the Centre in the Square. The doors open at 5:45pm, with the ceremony and performances starting at 7:15pm. 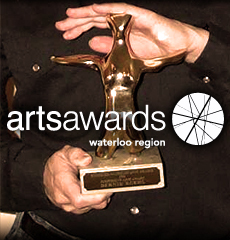 For the past 24 years, Arts Awards Waterloo Region has celebrated the artistic and cultural achievements of the artists, arts organizations and festival and events that make an outstanding contribution to our Region’s cultural life. 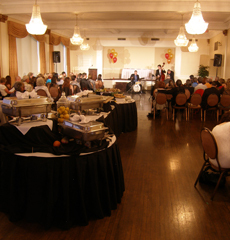 Past attendees have been amazed by the spontaneous performances in the lobby, prior to the ceremony, as well as the unique and innovative entertainment throughout the evening. One of the highlights, year after year, is the food tastings from 11 separate companies, who all contribute unique and delicious dishes to the event. 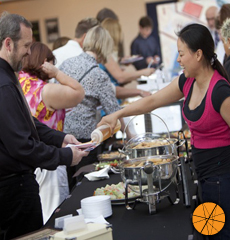 Attendees can roam the Centre, prior to the ceremony and sample delicious dishes from around the corner and around the globe. Everyone here at Machteld Faas Xander is eagerly anticipating the event and we hope to see you there! Comments Off on Arts Awards Waterloo Region is Almost Here! Category: Community Design | Comments Off on Arts Awards Waterloo Region is Almost Here! Sharing authentic stories makes the world a better place- that’s what we believe at Machteld Faas Xander. So for the summer months, we are holding a series of storytelling contests. The MFX June Storytelling Contest features Waterloo Region and the rules are simple; tell us about something memorable that happened to you or your family or your business here in the Waterloo Region. It could be a shopping adventure, a paddle along the Grand, a great meal, a wonderful picnic, a sporting event, a product launch, a fun moment … you get the idea… Oh, and it could win you a $100.00 gift card. E-mail your submission to Stories@machteldfaasxander.com along with your name, age, and preferred contact method by June 21, 2012. All stories must be under 1000 words and center around events that are closely tied with Waterloo Region. The winning story will be announced on June 29 at noon via twitter. The winner will receive a $100.00 gift card to Conestoga Mall and will have their story published in our blog. posted by Jessica on May 18th, 2012 | The Friday Fix is Back With a Twist! What are your marketing communications challenges? If you can describe them in under 140 characters, you have the chance to win a free 2-hour session with our team of marketing experts to solve even the toughest of marketing obstacles. Tweet us your marketing challenge at @MachFaasXan by Wednesday, May 23, and you will have your company entered to win. We will tweet the winner on Thursday, May 23, at noon and arrange a time and place for the session. We look forward to reading the submissions and meeting with the winner. Best of luck! Comments Off on The Friday Fix is Back With a Twist! Category: Business Design, Community Design | Comments Off on The Friday Fix is Back With a Twist! The importance of social media in communications and promotions is continuously growing and evolving. Twitter, Facebook, Pinterest, LinkedIn and Google+ are just a few in the parade of social networking websites that allow companies to interact with their clients and customers like never before. Many businesses want to become more involved in this world, but are unsure of the next steps. At Machteld Faas Xander, we are excited to welcome the newest member of our family. Jessica Colwell joined the team this week as our Social Media Specialist. Having graduated this year at the top of her class from Conestoga College’s Advertising Program, Jessica is intrigued by the possibilities and opportunities of this ever-evolving medium. She has been working with Machteld Faas Xander as an intern since February as part of her Conestoga program, and we were so impressed we hired her on! Over the course of her internship, and now as an employee she’ll be helping us all at MFX to develop strategies that will best utilize the power of these online communications, for us at MFX and for our clients. Jessica’s many passions include travel, painting and writing. She has had one poem published and several paintings displayed in three separate countries. Last year, she won $5,000.00 in a province-wide IMC (Integrated Marketing Campaign) competition to create a marketing communications campaign. We are always looking for more people to connect with online. Our Twitter account is @MachFaasXan. Our Pinterest account, Facebook page, Google+ page and other accounts all go by our name, Matcheld Faas Xander. We have already made some valuable connections through social media, but more on that in future posts.